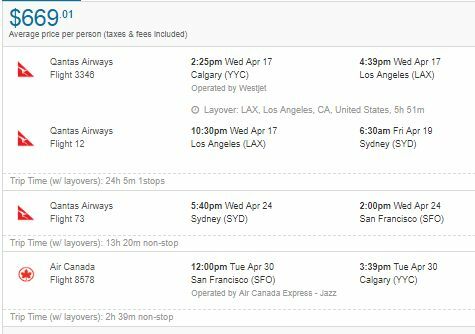 Qantas has once again dropped the price of their flights from Calgary to cities in Australia, this time down to between $651 and $685 CAD roundtrip including taxes! This is a new record for the cheapest flights from Calgary to Australia. You can also find flights from Calgary to a few other places in Australia and New Zealand (Adelaide, Canberra, Hobart, Gold Coast, Christchurch, Auckland) for a lot less than their usual price... ($784 to $897 roundtrip). Instructions below. Update 12/5 - The American Airlines flights are now gone as well. - look for the dates that are somewhere between $716 and $734 roundtrip. 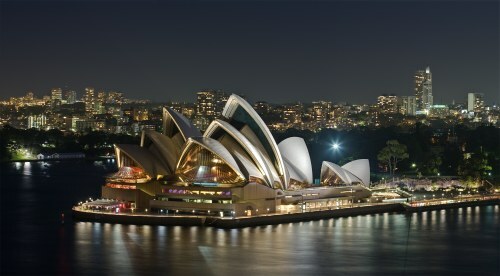 For example, let's say you found a flight from Calgary (YYC) to Sydney (SYD), from Apr 17 to Apr 30. 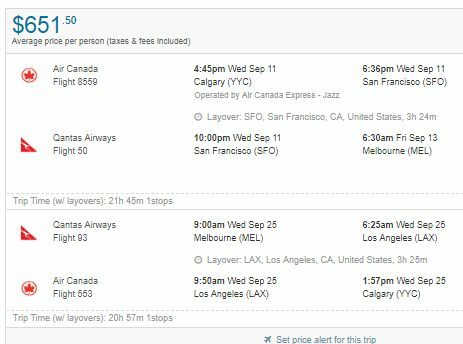 It's even possible to visit multiple cities in Australia *and* Los Angeles and still keep the price under $750! 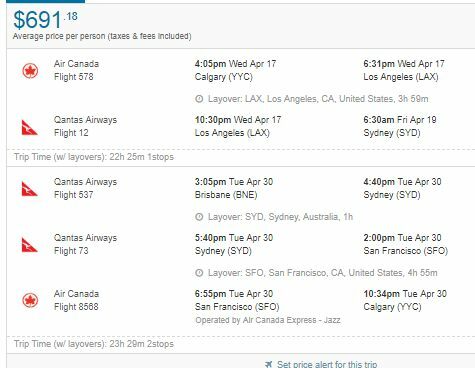 Update 12/4 - While the Qantas deal is finished, American Airlines is now showing flights from Calgary to Sydney, Australia for $714 CAD roundtrip including taxes. Certainly not as attractive as the Qantas deal, but also an unusually low price. NOTE: Even though Google Flights is showing $1293 or $1299, most of those dates are usually showing up for $714 CAD when you search for them on Kayak. 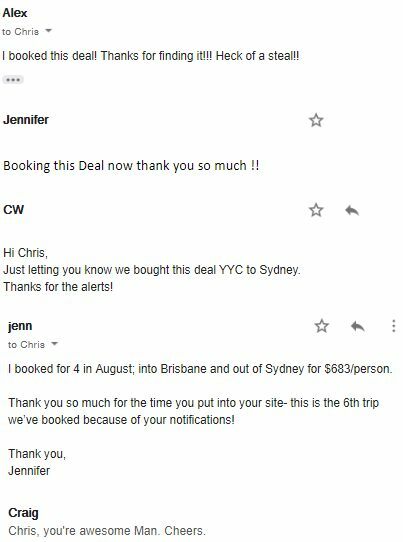 5 Responses to "Calgary to Sydney, Brisbane, or Melbourne, Australia - $651 to $685 CAD roundtrip | new record!" Stopovers in LAX are not fun. We did it last year going to Nadi, Fiji. The gates were not assigned ahead of time and the screens in each terminal only seem to show flights at that particular terminal. Terminals are 1, 2 and B (confusing). Signage isn't great either. But, we didn't have to reclear security when we changed terminals? Perhaps if I did it all the time, I would learn the drill. My advice, don't lollygag getting to the other terminal. We also received similar advice from family members who live in Australia; they avoid LAX for stopovers. They said that other cities are much better. Can this be a return trip from Sydney to Calgary? 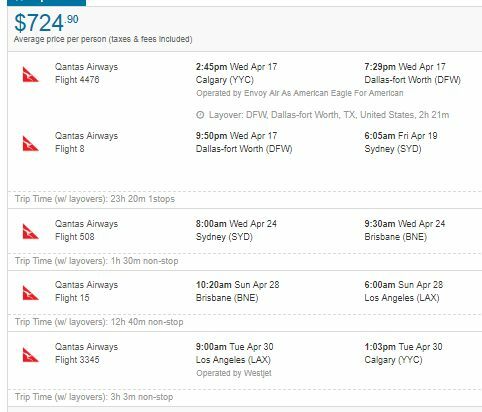 Unfortunately Australia to Calgary flights are still priced closer to normal levels, at around $1200-$1400 roundtrip. JMT: There's no question that LAX is a pretty bad airport, although the Tom Bradley international terminal is decent. That's the terminal they've named "B" - which I agree is confusing. These international Qantas flights would fly in and out of this terminal. I also agree that the signage at LAX is terrible. Half the time at LAX you're walking through a barren hallway and just hoping you're walking the right way. San Francisco (SFO) is the other layover airport that's common to see with this deal, which is a nice airport. Personally the best I could do was a layover at LAX on the way to Australia, and SFO on the way home. Sheeesh, all options priced around $700 were available on Friday and all gone the following monday. Yet another opportunity slipped through the fingers. Same thing happened with the $600 flights to Tokyo. Should've learned my lesson after missing that one. Update still working? I am not finding anything cheaper than $1200 on Kayak when following the steps.